A great story in today's Union Leader about CRDC customer Joe Lacerda, a veteran owned business owner. CRDC worked with Lacerda to help him purchase a building in downtown Manchester. 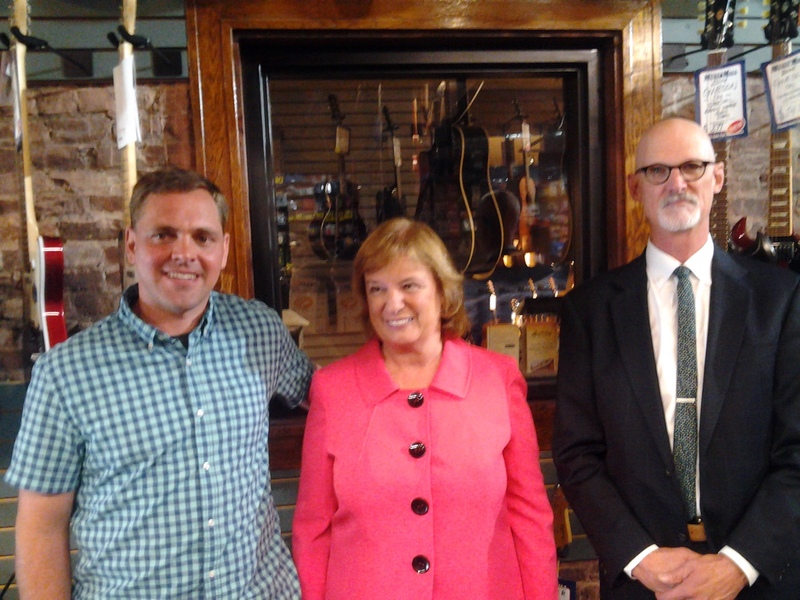 U.S. Rep Carol Shea-Porter toured Lacerda's business, the Manchester Music Mill. CRDC's Executive Director, Stephen Heavener was there to participated in the conversation and tour. Click here to read the online version of the Union Leader's story about Joe. MANCHESTER — Joseph Lacerda, owner of the Manchester Music Mill, 329 Elm St., used his GI benefits for school and a Small Business Administration veteran express loan to help start and grow his business. On Tuesday, he hosted U.S. Rep. Carol Shea-Porter, D-N.H., and both national and local SBA representatives and bank partners, who thanked him for his service and asked how they could reach more veterans to help them establish and grow their own businesses. “If 10 percent more veterans knew abut the SBA, it would really help,” he said. M. Rhett Jeppson, associate administrator for the Office of Veterans Business Development at the SBA, said there are programs to provide information and assistance to veterans as they leave the service. But starting a business is not at the top of the to-do list for every veteran leaving the military. Lacerda went to school to become an engineer and worked in that field for a while before he thought about starting what would become the Music Mill. Lacerda, whose business was designated the SBA’s 2014 Veteran-Owned Small Business of the Year, said while he has benefited from both kinds of help, he thinks the SBA could be more proactive in assisting veterans who seek to become business owners. “We didn’t know where to start,” said Lacerda, who began his business online, while working as an engineer. In 2005, he opened a brick and mortar store in the millyard. He’s now on Elm Street, but it wasn’t easy, he said. “It took a year of going up and down the street, trying to buy a building,” he said. Finally, the man who now owns Van Otis Chocolate agreed to sell him the building he’s now in. “He became my tenant,” said Lacerda, with a 20-year lease. Lacerda had partners early on, he said, but he bought them out and now the business is all his, succeed or fail, and he’s seeing the business succeed and grow. While he still has an online business, it’s a shrinking share. He has 11 teachers on staff and the music school is booming. He makes sure his students perform publicly as well. Asked by Shea-Porter and others visiting the business Tuesday afternoon what he had learned, Lacerda said he had to learn not to be afraid of the unknown. “I’ve learned to take risks,” he said. Jeppson said veteran-owned business have annual receipts of $1.1 trillion. He said one in 10 businesses is veteran-owned, with a preponderance of sole-proprietor businesses. One of the goals of the SBA 504 program is expansion of small business concerns owned and controlled by veterans, especially service-disabled veterans. After leaving the Music Mill, following a tour of the business as well as a conversation with Lacerda, Shea- Porter walked across Elm Street to meet with Market Basket employees out picketing before heading to the Seacoast to meet with another business owner.